It is fitting that Hanukkah and Thanksgiving intersect this year, because as the year comes to an end, it seems that I have a lot to be thankful for. Like many other congregants, my husband and I joined Temple Emanuel, because we were looking for community. Almost immediately after walking through the doors, first for a lively Shabbat B’Yachad, and then for a series of thought-provoking high holiday services, we knew this was the right place for us. We quickly made friends in our newlywed chavurah, and I even played a bit part in the annual Intergenerational play. While my husband joined the temple softball team, I found my niche planning events for the temple’s 20s &30s group, and teaching the Jewish Holiday Cooking series. Before we knew it, we had become a part of that community we were searching for. Just as no Hanukkah party is complete without crisp, golden-brown potato latkes fried in piping hot oil, I would be remiss if my Thanksgiving feast lacked the characteristically orange tinge of a sweet potato side dish. 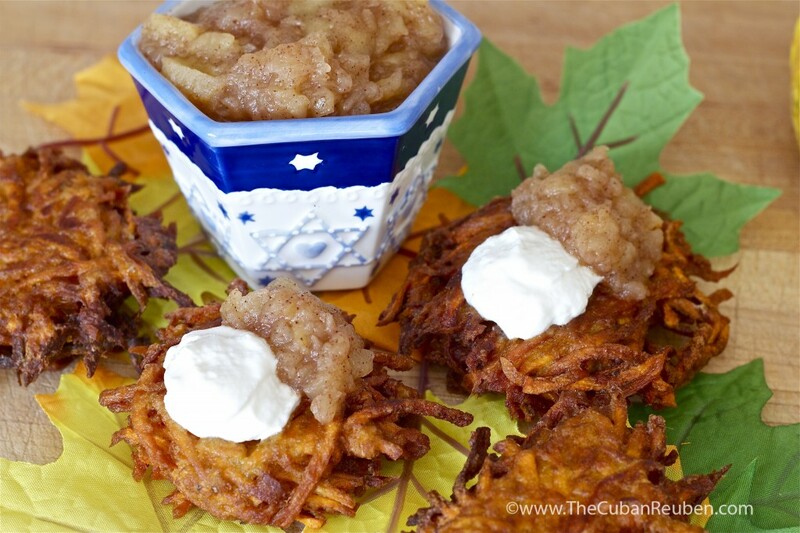 That’s why instead of traditional latkes, in this year’s Hanukkah cooking class, we’ll be taking our favorite elements of both holidays, and combining them into one dish: Sweet Potato Latkes with Autumn Spiced Applesauce. The combination of spices that permeate the applesauce work to enhance the distinct flavor of the sweet potato, and bring to it a certain warmth reminiscent of my favorite Thanksgiving casserole. And the shredded strands of sweet potato bound together with flour and egg remind me of the type of sweet potato fries we all love: crunchy on the outside yet soft on the inside. No matter if it comes early or late, a common truth is that Hanukkah always seems to creep up on us. Some say that this convergence of holidays won’t happen again for nearly 80,000 years, and in my book, that rare occurrence is worth a little attention. This year, let’s take the opportunity during the festival of lights, and share our thanks for the community that has welcomed us all! As featured on the Temple Emanuel of Beverly Hills blog. Something a little bit different to commemorate the once-in-a-lifetime event that many are calling, “Thanksgivukkah. Peel, core, and chop the apples, and place them in a large microwave-safe bowl. Add the following ingredients, and toss to coat. Cover the bowl with plastic wrap, and pierce a few holes using a fork. Microwave on high for 7 minutes, or until apples are soft. Using oven mitts, carefully remove the bowl from the microwave, and uncover. Using a potato masher, mash the apples to desired applesauce consistency. Serve warm or chilled. Grate the potatoes. Place the grated potatoes in a cheesecloth or thin kitchen towel, and squeeze out the starchy liquid. Place the onion and garlic in the food processor, and chop until very small. Mix the onion mixture and the potatoes. Add the eggs, salt, pepper, and baking powder. Add the flour until it creates a slightly thick batter around the shredded potatoes. Heat the oil in a pan over medium heat. Add a spoonful of the batter at a time, careful not to overcrowd the pan. Fry for about 2-3 minutes. Flip the latkes, so they brown on the other side, and fry for another 2 minutes or until browned. Try one at first to see if the seasoning is right. If it is well-seasoned, continue frying the rest of the latkes. This recipe is very easily halved or doubled depending on the number of guests you anticipate. Previous PostPrevious Tostones for Hanukkah!